This is the product that we see the most in the replacement window world. Most of the manufacturers are very similar in overall appearance, but can be very different in construction and quality control. Alsides, NT Windows, The Don Young Company, Kensington, American Craftsman, Dakota, and Simonton are all build windows that seem very much the same, but they can vary greatly. Their cost is usually about $300 to $600 for the window unit itself (depending on size and options selected)........then an install. This puts replacement window costs at around $400 to $600 per window installed depending on the product, options, color and performance of the product. Many Dallas Replacement Window Companies have windows costing $800 to $1200 each. The Pella's can run $2000 a piece. We offer similar products at hundreds of dollars less due to our low overhead and advertising costs. We offer windows and installation without excessive costs that can be associated with large advertising and big showrooms. NT Window, Single Hung, Vinyl Windows, Dallas, Texas, Archtop, Replacement Windows, Cardinal GlassContact us today! There are several great manufacurers here in Dallas and Fort Worth and a few that are not so great. Some of our favorites include NT Window, Don Young Company and the Lansing Windjammer. Some of the better known national manufacturers we offer include Milgard, Alside, Kensington and Simonton. Most window manufacturers offer several models so make sure you're looking at the model itself and not just a manufacturer. It's typical for a company to have a good, better and best model. I really think the low end product from almost anyone is not a good choice. You get what you pay for with windows and a few extra dollars spent on materials is never a waste. Don Young Windows, Dallas, Earthwise, Single Hung, local, window manufacturersCall us today! Most high quality manufacturers offer a lifetime warrantee, but thats not the entire story. Some manufacturers have a lifetime warrantee because they think you're moving. Some have one because they think you won't notice the flaws in their products, or be motivated to contact them for replacement parts, and some manufacturers have a lifetime warrantee because they build a great product that will last for a lifetime. Our Energy Star Compliant and Stimulus Compliant Window Connection Top Picks will be the latter.....they really last a lifetime. Alside Windows, Mezzo Vinyl Windows, Single Hung Mezzo, Extruded screens, Dallas, TexasWe're here to help today! 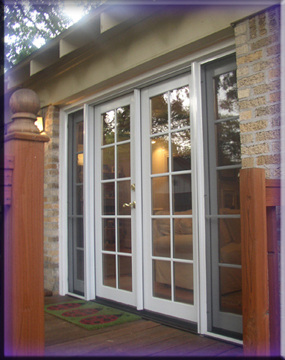 One inch to 3/4" Insulated Glass (All with Low E glass from Cardinal Glass or PPG). 3 1/4" Main Frame (the thickest residential frames available). Fusion Welded Main and sash frames offer strength that's un-equaled in mechanically assembled units. Double tilting sashes provide easy cleaning from the interior of the home. Full screens are available so you can ventilate from the top or the bottom simultaniously. Half screens can work on either the top sash or the bottom sash depending on your preference, and save your clear view of the outside through your top sash. Double cam locks are usually standard on all windows over 24" in width. Many window manufacturers have vent latches that allow you to open your window 2 inches for air, but no further. You can have fresh air from your new windows without sacrificing your home's security. Double Tilting Window Sashes for easy cleaning are the standard in a double hung. Presidential, Vinyl Windows, Dallas, Texas, Tx, Prairie Lite Grids, vinyl replacement windowsContact us today! Grid options in Double Hung Windows. Grids between the glass or Simulated Divided Lites are available from many manufacturers. Windows are available in White and Beige from all manufacturers. We also have an ADOBE Colored product from three different vendors. Custom Exterior Colors are offered by certain manufacturers who offer a painted or vinyl clad exterior vinyl window. Exterior Color upgrades are quite costly and will add about $100 to $150 to the cost of any window. Better models will have dust covers on the interior to cover screws. Many models will have night latches to allow the window to be open 3" but not any further to allow for ventilation but not entry. Better models will have aluminum or steel reinforcements. Many will have foam filling. Windows with reinforcements are preferable to foam filling as the structural integrity of the sash is far better with the reinforcement and the foam filling adds less than 1% to the effeciency of the window. What kind of gas is between the panes of a double hung window? Argon Gas is available in any high quality window. Builders grade and cheaper windows don't offer gas between the panes. They simply have a dead air space. Argon is a gas that is 5 1/2 times denser than oxygen. It is clear and odorless but it helps prevent thermal and audio infiltration to the home. A great option for the noisy street window or the very hot west side window. Builders Grade Windows have dead air in a hermetically sealed insulated glass unit, but the air inside the unit has no added value to speak of. Simonton, Pro Series, Simonton 5050, Simonton 5500,Contact us today! How to install an exterior door. If you're a do it yourselfer and in need of a new front or back door, this makes for a great read. It's every step in the door installation process. Noise is a good reason to buy new windows. Here's some great links and information on the different options to control sound transmission. It explains STC ratings and OITC ratings. The house has foggy windows, so now what? There are several options. This should give you insight on what to do if you're a buyer or a seller.
" I did substantial research into several local window and door companies before going with The Window Connection. I felt the level of concern Dave had for my project was significantly higher than the other contractors I recieved estimates from. He offered us a great price on a quality product but what really struck me was the quality of workmanship on the project." "Dave Traynor is one of the best experts in his field of work! His support for our TV Dream Home 2013 on our tv show on the ABC network has been a wonderful experience to work with a great expert. I recomend Dave and his company if your looking for someone honest and talented!" "Dave these windows have changed my life. It's such a great look and it motivated me to do other things on the house so they'd measure up to the wonderful new casement windows." Before and After Gallery of our work. I'm pretty proud of our relationship with Alside and here's a great link to see more of their products. Our new site is under construction but we're here to serve! Call us today! We are now a three time winner of the Energy Master Dealer of the Year! Come find out how we do that. Call us today. We're here!